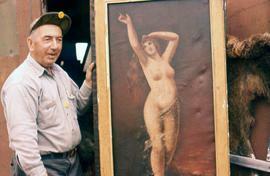 Colour Ektachrome 35mm slide depicts a man standing next to a painting.Note: Colour adjusted on JPEG. 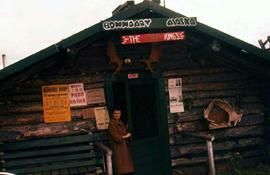 Colour Ektachrome 35mm slide depicts Phyliss Snider standing in front of the doorway of a lodge in Boundary, Alaska, close to the U.S/Canada border.Note: Colour adjusted on JPEG. Colour Ektachrome 35mm slide depicts a red passenger bus at a gas station.Note: Colour adjusted on JPEG. Sign for "Boundary Lodge" as well as "70 miles to Dawson"
Colour Ektachrome 35mm slide depicts a sign of "Boundary Lodge" as well as "70 miles to Dawson".Note: Colour adjusted on JPEG.